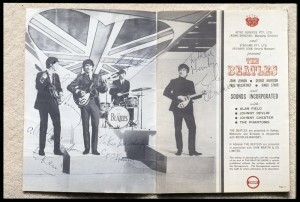 State Library Victoria – The Beatles in Australia: all five of them! 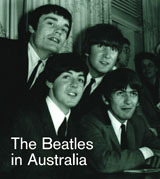 The Beatles in Australia: all five of them! Andrew McConville, the State Library’s very own mop-top, couldn’t resist commemorating the anniversary of this special madness! In Melbourne on 14 June 1964 all five Beatles, John, Paul, George, Ringo and Jimmy, faced the press together for the first and only time. The press conference took place at the Southern Cross Hotel. When Ringo Starr had come down with tonsillitis just prior to the Australian tour Jimmy Nicol was plucked from obscurity as a hasty replacement. Ringo had collapsed on 3 June 1964. The next day Jimmy Nicol was onstage playing drums with the fab three in Copenhagen. Prior to that he had no connection with the band. 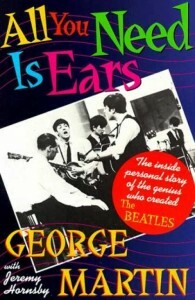 He had been recommended by producer George Martin. The three Beatles and Jimmy Nicol had arrived in Australia on 11 June 1964. 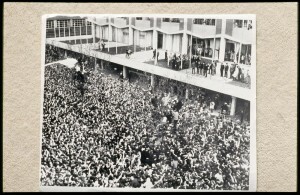 On 12 June in Adelaide vast crowds greeted them. Estimates vary but at least 200,000 crammed the streets. The band played several shows at Centennial Hall in Adelaide with Jimmy Nicol on drums.Ringo arrived in Melbourne on 14 June 1964 and was reunited with the group. All five posed for photographs and entertained the press. It was front page news in the Melbourne newspapers but Jimmy Nicol was barely mentioned. The next day he was on his way home to London. His ten days as a Beatle were over. Ringo was back on drums for the shows at Festival Hall on 15, 16 and 17 June. 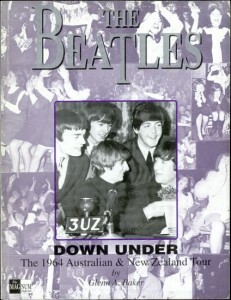 The Beatles then went on to Sydney, New Zealand and Queensland. They left Australia on 1 July 1964. After drumming for the Beatles, Jimmy NIcol went back to obscurity. He was declared bankrupt in 1965. In 2004 he was tracked down by a journalist in London living a reclusive life, uninterested in revisiting his ten days amidst the maelstrom of Beatlemania.